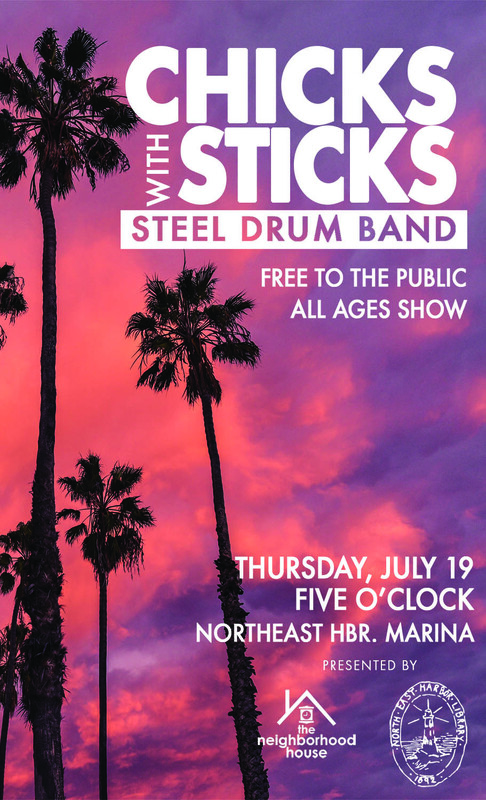 Guaranteed to put a little tap in your toes and some pep in your step, the "Chicks with Sticks" Steel Drum Band is set to take the stage to do it up tight and out of sight. Join The Neighborhood House and Northeast Harbor Library on Thursday, July 19 as we celebrate our year 'round collaborative efforts with this FREE all ages performance. The FREE show will be held on the green at the Northeast Harbor Marina beginning at 5:00pm. In case of rain, the show will be held indoors at The Neighborhood House. We strongly encourage you to to bring the family along, grab some dinner to-go from one of our local restaurants, and make an evening of it!